Create cases as you import files—in the Import Files dialog box, select Create a case for each imported file. The entire content of the file is coded to the case created for it. Create cases from selected files—this is most useful when the entire file represents a single case (unit of analysis). When you create cases from your files the entire content of the file is coded. Create cases based on the speaker names in a document. Import a spreadsheet (called a 'classification sheet' in NVivo) containing respondent names and demographic variables. Import a survey or social media dataset and automatically create and classify cases based on the content. The approach you take depends on the type of data you are working with. 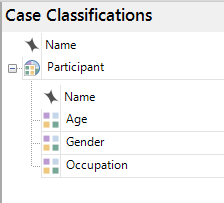 In Navigation View, right-click on the Case Classifications folder, and then click New Classification. Enter a name for the classification. For example, Person, Participant, Interviewee. In List View, right-click on the classification and click New Attribute. Enter a name for the attribute. For example, Age, Gender or Occupation. If you know the values for the attribute you can add them now. Click the Values tab (at the top of the dialog) and then click Add. For example—for Gender, you could add Male and Female. In List View, select the interview files. (Hold down the SHIFT key to select multiple files). On the Home tab, in the Item group, click Create As Cases. Assign the cases to the new classification. Now, you have a case for each participant and the content of the interview has been coded at the case. Click on Cases in Navigation view to see the new cases. 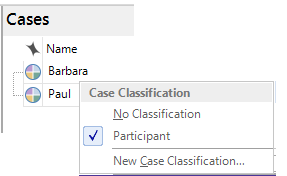 In Navigation View, under Case Classifications, click the new classification. 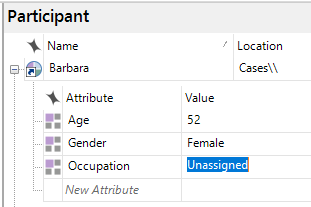 In List View, expand each case and select the attribute you want to work with. Click a value to update it. As you type, NVivo suggests a matching value—you can choose this value or enter a new one. If you know the values for the attribute you can add them now. Click the Values tab (at the top of the dialog) and then click Add.. For example—for Gender, you could add Male and Female. In List View, select the focus group files. (Hold down the SHIFT key to select multiple files). On the Home tab, in the Coding group, click Auto Code, and then choose Speaker Name in the Auto Code Wizard. Enter the name of each speaker as identified in the selected files. Assign the cases to a classification and choose where you want to store them. Click on Cases in Navigation view to see the new cases. In Navigation View, under Case Classifications, click the classification. Expand each case and select the attribute you want to work with. Click the value you want to update. As you type, NVivo suggests a matching value—you can choose this value or enter a new one. The speaker name must appear at the start of a line. It cannot be proceeded by any characters—including tabs and spaces. The speaker name can appear on the same line with the response or on a separate line above the response—as long as it is at the start of a line. The transcript can be formatted as a table with the speaker name in the left column and the response in the right. Each speaker must be identified by a unique name. 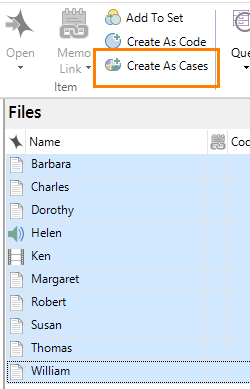 NVivo creates a case for each unique speaker name and codes all content by that speaker at the case. If you are analyzing audio or video transcripts—and you have added a custom field for speaker—you can auto code to automatically create a case for each speaker. Enter a name for the classification. For example, Speaker, Participant, Interviewee. On the Home tab, in the Coding group, click Auto Code. 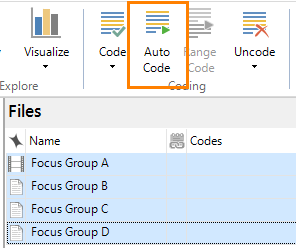 In the Auto Code wizard, click Use the style or structure. Add the custom speaker field to the Selected transcript fields (it may already be there by default). In List View, select the new cases. Right-click, then click Classification, then choose a classification. When you import responses from SurveyMonkey or Qualtrics, or import data from spreadsheets or text files—the Survey Import Wizard automatically creates and classifies cases for each respondent in a survey. 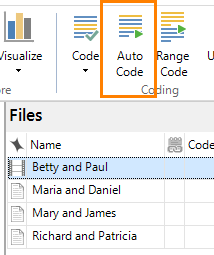 If you are working with datasets containing social media data imported from NCapture, NVivo creates cases to represent each user when you auto code by Username. So, you can create classified cases at the same time as you auto code the dataset. When you auto code by Username, the cases are assigned to the classification 'Facebook User', 'Twitter User' or 'YouTube User', and profile information about the user is stored as attribute values on the cases. In List View, right-click on the social media dataset, and then click Auto Code. Code at cases for each value in a column. Choose the column that contains the Username. Choose the content you want to code at the case. For example, Post and Comment Text or Tweet. Choose a location for the new cases.